The CS Yacht Owners Associations bring together people from all over the world who own, have owned or wish they owned a CS yacht. This wonderful line of racer/cruisers was built in the 70s and 80s, in sizes ranging from 20' to 40'. 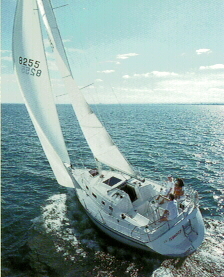 Canadian Sailcraft unfortunately stopped manufacture in 1992 - a victim, like many other quality boat companies, of the ill-advised U.S. luxury tax. But their boats sail on, providing tremendous pleasure to their proud owners. Note: In 1999, CS Yachts International began production again on a limited basis. An e-mail in 2005 informed us that: "You should note that CS is in business and have delivered the first of the new CS Power Cat 42's and have orders for more. In addition Carlson & Wentzell Marine Inc. have started marketing the 363, 393 and the Custom 44 sailing yachts in addition to the Power Cat 42 in Atlantic Canada and Bermuda." Check the link above to their web site for current status. If you would like to join CSOA or CS West, please contact us for information. Now, please browse our pages as a way of getting to know us. Our site guide at the left will get you started. NOTICE: There is a mailing list server for the convenience and enjoyment of anyone interested in CS Yachts. It allows you to participate in discussions with others who share that interest. You need not be a member of CSOA to join this list. However, it is absolutely not to be used for commercial messages or any purpose other than that stated above. Anyone abusing the privelege of joining the list will be removed from it at the sole discretion of the list moderator. A searchable archive of all the mesages that have been posted since the list server's inception is available - see "On-line Discussions" in the Site Guide at the left. How would you like to help create an on-line knowledge base of information about CS Yachts? It's easy. Just contribute to the CS Yachts Wiki. Don't feel you're ready yet to contribute? That's OK. Drop in and see what others have written. Maybe you'll find you have something to say afterall. Or maybe you'll just find it's a great place to increase your knowledge about the boats you love. Here is GREAT news for every CS Owner! We now, as owners, and an organization, have a "real" forum that allows the posting of photos and links and it costs our organization zero, nada, zilch, nothing!!! It is hosted by Sailnet - check it out. Thanks, Rod, for setting this up. Thanks, Dan, for setting this up. Do you have sailing knowledge or skills that you would like to share? Can you get them video-taped? Then maybe you'd like to post an instructional video on the internet for the other members of the CS community. Learn more. If you're interested in sharing and discussing photos of your sailing and CS owning experiences, have a look at our Flickr group - CSOA. We would be delighted to send you more information about the CS Owners Association or CS Yacht Owners West .